Horst Brüning, a set of 9 armchairs mod. 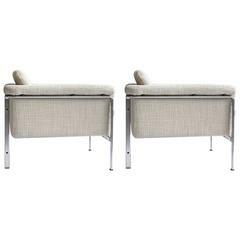 6911 manufactured in flat chromed steel and original heavy wool upholstery. Produced by Kill International, Germany in 1968. The German designer Horst Brüning created furniture that implemented the simple idea of minimalism, functionality, durability, timelessness and yet captures the spirit of the time. In the 1960s Brüning came in contact with Kill International and the Architect duo Fabricius & Kastholm, involving a successful exchange of ideas. Brüning and Fabricius & Kastholm's designs were originally manufactured at Kill International in Stuttgart. The chairs can be reupholstered to clients requirement. Nice pair of Horst Bruning lounge chairs. Made of steel and camel/orange leather. 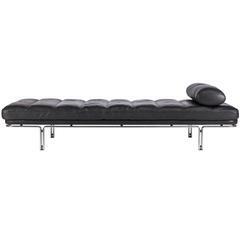 Functional daybed designed by Horst Bruning for Kill International, circa 1968. Superior construction with original leather cushion and headrest in excellent original condition. Rare sofa designed by Horst Bruning. Very nice design made of black leather and steel.